The battle lines for Greece’s next general election have been drawn. Amid the bitterness spewing forth from SYRIZA, New Democracy and their supporters, the party’s two leaders have set out alternative visions for the country based on different economic policy, for any Greeks that are still interested in that kind of thing. As the two leading parties in Greek politics sink deeper into poisonous exchanges revolving around soundbites, intentional misrepresentation of each other’s views, twisting of facts and outright propaganda, little room is left for actual political ideas. An ill-advised reference by a New Democracy MP to the three-pillar pension system the party wants to introduce having first been put into effect by General Augusto Pinochet in Chile was grist to the mill for this tribal approach to serious issues. Similarly, Finance Minister Euclid Tsakalotos’s assertion last week that the current pension system would not need further reform to bring down costs over the longer-term because of “pensioners naturally exiting the system” in the coming years was treated by his opponents as an intentional attempt to drive grandparents to an early grave. This is a foretaste of what we can expect as the next elections (which have to be held by the autumn of 2019) move closer. It is unlikely there will be much effort to debate ideas or policies in this scrum of fanatics. This would be a shame under any circumstances, but especially as Greek leaders have started to set out plans for how they want to shape the economy (and with it the country) for the first time since Athens agreed its first bailout in 2010. Prime Minister Alexis Tsipras and opposition chief Kyriakos Mitsotakis made copious pre-election pledges designed to tempt voters when they spoke at the Thessaloniki Expo earlier this month, but they also outlined how they believe the country should move forward after a devastating decade. Tsipras presented himself and his SYRIZA party as the guarantors of an equitable recovery. By focusing on increasing the minimum wage, bringing back collective wage bargaining, enforcing the extendibility of labour contracts, introducing a new housing benefit scheme, shifting the burden of the ENFIA real estate tax to larger properties and bringing down pension contributions for the self-employed, Tsipras attempted to give the impression that he wants to ensure those further down the ladder are the ones who will benefit most from the recovery. He is positioning himself as a defender of Greeks who missed out on the spoils during the years of plenty and who were cast adrift during the crisis. SYRIZA, he argues, will not allow Greece to go back to the time when the government cozied up with big business and the media, allowing its friends to benefit from an artificial prosperity at the expense of the many. To achieve this goal, Tsipras sees the state as a key driver because it has the power to get the weakest back on their feet and provide them with the protection they lacked, while fending off the advances of the few. 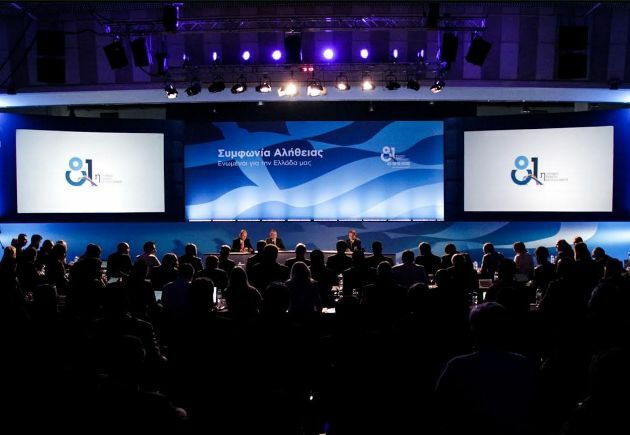 The vision presented by Mitsotakis was very different. He argued that SYRIZA’s ideology places a limit on Greece’s recovery potential. His plan, in short, is to rein in the state and try to unleash the country’s creative and productive forces. To do this, he plans to overhaul the education system so it is more in tune with the economy, bring down taxes, encourage social mobility and drive growth at almost double the rate (4 percent) than is currently expected. The opposition leader proposed a range of policies to help create the environment for this economic awakening. The highlights included the reduction of the basic rate of income tax for those with annual incomes up to 10,000 euros from 22 percent to 9 percent, the reduction of corporation tax from 29 percent to 20 percent, the levy on dividends being slashed from 15 to 5 percent, a 30 percent cut in the ENFIA property tax over two years, reduction in contributions to main pensions from 20 to 15 percent, scrapping of trade tax for the self-employed, cutting the VAT rate in the food service sector from 24 to 13 percent, a three-year VAT grace period and 40 percent tax discount on construction/renovation work and a 1,000-euro increase in the tax-free threshold per child for each household. The conservative party’s supporters view the policies as audacious, sceptics see them as aspirational, while critics believe that they are implausible. New Democracy puts the fiscal cost of the package of measures unveiled by Mitsotakis at 6 billion euros over a four-year period. Other estimates have put the figure closer to 10 billion euros. In either case, the cost is substantially higher than the pledges made by the prime minister, which were seen by the institutions as largely being in line with Greece’s fiscal path for the coming years. If Greece wants to take its future seriously, the pledges made by Tsipras and Mitsotakis, as well as other party leaders, should be assessed by an independent body, which would have the capability of testing whether the promises have been accurately costed, as the parties claim. If there was an appetite for serious political debate, the details of what Mitsotakis vowed to implement would be inspected in greater detail. Questions would be asked, for instance, about whether the fiscal space to adopt these policies actually exists. Speaking to investors in London last week, Tsakalotos reportedly told investors in London that the total fiscal space over the next four years will amount to 3.5 billion euros. How a New Democracy government would find the extra 2.5 billion euros or more that its economic programme requires, might be one of the questions directed at the opposition party. Mitsotakis has argued that lowering taxes would lead to lower tax evasion (as the incentive to dodge responsibilities would diminish) and provide an immediate pick-me-up for the economy. There are doubts, though, whether the results would be as instant as the opposition leader suggests. For starters, Greece’s tax compliance problems span a much larger period than recent years, when the burden on taxpayers has increased considerably. Although there have been significant improvements in the tax administration, it is clear that reducing evasion markedly is something that will take time and will require a buy-in from Greek society. This is not something that is likely to happen in a single term in office, let alone a year. Furthermore, most Greeks are taxed at source (wage earners and pensioners) so even if evasion is gradually reduced among the self-employed, the impact on revenues is likely to be limited over the short-term. All this has been evident in the sceptical approach that Greece's creditors have consistently taken when Athens tells them that it can reduce evasion. Their stance has always been that Greece should produce the results first, before any concessions are made. Also, the New Democracy leader has suggested that his commitment to structural reforms will help win him friends in Europe and facilitate his discussion with the institutions about lowering Greece’s 3.5 percent of GDP primary surplus target, which is in place until 2022. Recent history suggests this is wishful thinking. The lenders have never shown a willingness to reduce fiscal targets because they are so closely linked to Greece’s debt servicing. Athens has consistently been told that it can use any fiscal space that comes through an outperformance, rather than creating it by meeting lower targets. The notion that the creditors would be willing to change tack if Mitsotakis replaces Tsipras neither reflects the current sentiment on the lender’s side, nor is it in line with the experiences of previous Greek prime minister, including former New Democracy leader Antonis Samaras. Another aspect of the centre-right opposition’s pledges that deserves closer scrutiny is the claim that 2 billion euros savings can be made in the public sector over two years through a combination of limiting hirings to one appointment for every five departures, use of public-private partnerships, e-governance and spending reviews. Greece’s lenders are also likely to approach this issue with scepticism. Firstly, the limit on hirings has to be matched to the needs of the civil service, some parts of which are genuinely short of staff after the downsizing since 2010. Beyond that, the lenders are also mindful of the fact that public services have been stripped to the bone, as has been repeatedly highlighted by the International Monetary Fund in its reports, and cannot be pared back any further. As for the greater use of e-governance and similar methods to improve efficiency and reduce costs, the creditors are likely to adopt a see-it-to-believe-it attitude on this as well, having heard such promises in the past but with few results to follow. In his Thessaloniki speech, Mitsotakis castigated Tsipras for only referring to the public sector to announce job hirings and not to explain how he plans to make it more efficient. While this is a valid criticism of the prime minister’s approach, there is a flipside, which is that the opposition leader did not explain how he plans to improve Greece’s depleted public services or what role they will play in augmenting the country’s recovery. Furthermore, the plan to overhaul Greece’s patched-up pension system also requires greater detail. The late Chilean dictator aside, the three-pillar system is now used in many countries, European states included. There is nothing that ground-breaking or controversial about introducing a private savings element to the scheme. However, what has to be explained to working Greeks and pensioners alike is how the country will move from the current system to the one proposed by Mitsotakis. Estonia, for instance, uses a three-pillar system that was reformed in 2017 and the transition period for the first pillar was set from 2020 to 2036. The reason this needs to be set out in detail is to explain how the system will remain sustainable without a sudden rise in costs for taxpayers or a massive shortfall in contributions, given that it is distributive rather than capitalised at the moment. For example, the Labour Ministry claimed that a shortfall of 25 billion euros would be created as workers would stop funding the current supplementary pension scheme to pay into their own savings programme. These figures also need to be confirmed, but they are an indication of the kind of answers that New Democracy has to provide if its plans are to be considered credible. Finally, Mitsotakis also unveiled plans to transfer the responsibility for collecting the ENFIA property tax to the local government from 2021. He said that the 2 billion euros in revenues from the tax (after his reductions) is roughly equivalent to the amount of state funding municipalities currently receive. Under his scheme, the local authorities would be responsible for setting the tax rates in their region, while the Independent Authority for Public Revenue would continue to collect the levy, but pass on the revenues to mayors instead of the Finance Ministry. The proposal is an interesting attempt to make municipalities more fiscally responsible (rather than relying on the central government to baby-sit them) and provide citizens with greater incentives to ensure that their local authorities deliver an adequate service. One of the criticisms of the proposal, though, is that municipalities with high value land and properties will benefit and those in mountainous or remote areas, of which there are many in Greece, would be left cash-strapped. New Democracy insists that there will be some kind of stabilising mechanism to ensure a degree of fairness. It is, however, another aspect of the promises made that requires further scrutiny. The probability, though, is that none of this will be discussed maturely or in any great detail in the coming months. The nitty gritty of economic policy does not lend itself to the zealous political discussion currently taking place in Greece. Voters will be left with aggressive slogans and screaming headlines rather than any insight into the reliability of what their politicians are offering them. The greatest shame of all is that Greece has waited almost a decade to start shaping its future but what either side has to offer in this process is unlikely to count for much.